Falls Creek Falls is located 1.7 miles from Road 3062 in the Gifford Pinchot National Forest (WA). This powerful waterfall drops 335' in three stages before tempering down sliding cascades on Falls Creek. It's arguably one of the most scenic - and perhaps overlooked - falls in the Columbia River Gorge, and will impress even during dry periods. Its location far from the busy I-84 corridor in Oregon keeps crowds lighter than it might otherwise deserve. Falls Creek originates from springs and tributaries on Red Mountain Plateau and gathers considerable momentum before dropping in 109', 135' and 91' tiers*. Falls Creek Trail #152 runs level through a young forest to a bridge over a narrow gorge (.35 miles : 1,465'). It traces the creek before pitching up in a noticeably older forest to the Trail 152-A split for Falls Creek Falls (1.2 miles : 1,805'). Follow signs (right) up to a bridge across a mossy, tumbling tributary (1.39 miles : 1,937'). You'll round a corner with a partial look at the upper tier just before reaching the main viewing area (1.7 miles : 2,015'). The upper tier is hard to see from this angle, but the fanned-out middle tier and hard-plunging lower tier are in perfect range. The area can be misty and deceptively slick - use extreme caution when maneuvering to different view points. 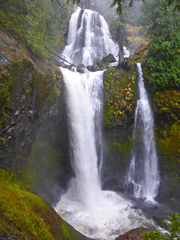 *Waterfall heights and segment lengths for Falls Creek Falls are cited from Waterfallsnorthwest.com. No pass or fee is required to access the Falls Creek Trail. Falls Creek Trailhead is located 23.1 miles from Bridge of the Gods on the Washington side of the Columbia River Gorge. Turn left on Wind River Road and drive 14.2 miles to a 'Y' fork at Mineral Springs Road and Wind River Road. This fork is just past the Carson Fish Hatchery. Bear right on Wind River Road and drive .8 miles to Road 3062. Turn right on Road 3062 and drive 2.2 miles to its terminus at Falls Creek Trailhead. The lot is a large cul-de-sac. Road 3062 is a graded dirt road. High clearance is recommended, but the road is suitable for 2WD cars in good condition. Watch for large potholes. Drive carefully on these narrow, winding roads. Watch for large potholes. Be mindful of speed limits through developed areas between Carson and the trailhead. Note: FS 3062 is closed December 1 - April 1.